Three Gals and a Guy : Is My Child Normal? I’ve struggled for a while about writing this specific post. It is difficult for me to write about and have it all in the open for everyone to know about. (Ok, maybe the few who read this blogJ). I think every new and even seasoned parent sometimes questions their child’s development at one time or another. Why isn’t my child walking yet? Or, why isn’t she saying very many words yet? We look at other children around the same age and we start comparing and then we get filled with anxiety when our child isn’t doing what that child is doing yet. Another part of this is deciding when a behavior is within the “normal” range of a typical developing child or if it’s not. Is it normal that my child freaks out when foods touch on their plate? Is it normal that my child lines things up in a perfect order? What I have found is that there is such a wide range of “normal” that questions like these are so very hard to answer. It makes it hard to determine that fine line between “normal” and a problem. The reason why I have debated writing this post is because recently we have had these exact same questions bombarding our night time conversations as Sophia has entered the school system and it’s something that hits very close to home. But I have decided to write this because maybe, somewhere, it might help that mom or dad out there with the exact same questions. We always chalked up her slow to warm up personality on shyness. We would joke ,“that’s just Sophia- when she wants to be friendly with adults, she does and when she doesn’t, she doesn’t.” Sophia definitely has maintained this sort of temperament all through infancy to present. She has always been the timid-slow to warm up to new situations and people- she’s gotta check everything out before diving in. She connects with some adults just fine and others; she buries her head in my leg and my once singing-can’t keep her quiet in the car-daughter becomes silent. It can happen at the grocery store or at the doctor’s office- a seemingly, nice adult asks Sophia a question or compliments her on her outfit and she goes silent. Sometimes, even in situations that she is uncomfortable in she begins saying “Mama, mama” in a baby voice. I have always reminded her to “use her big girl voice.” Again, we didn’t think much of it and chalked it up to shyness. It has definitely gotten better and I have slowly seen her come out of her shell but she still has her moments. Recently, at school, if she is requested by an adult to answer a question or prompted in anyway, she shuts down- doesn’t want to talk, doesn’t want to choose a center, doesn’t want to participate. She does slowly come out of it but it has happened now, three times. You might think, three times isn’t a big deal, but now, as she is getting older and we are thinking about whether to enroll her in Kindergarten next year- the doubt slowly creeps in. IS her behavior normal? If she enters Kindergarten and an adult asks her a question- and she goes mute and shuts down- how will this work? How will she succeed if she doesn’t respond to prompts by a teacher? As I am thinking about her “shyness” all the questions and thoughts come into my mind at once and I am thinking about her quirks in behavior- the way she hoards her things and has to have things “just so,” how she is a picky eater and has an aversion to some textures, how she sometimes doesn’t use her words and it results in a meltdown, her difficulty with change in routine, and more importantly, how she becomes shut down if an adult tries to interact with her. And then I think about the opposing arguments, she DOES interact with MOST adults- she does fine with this person or this person, she plays with friends at school and daycare, she befriends peers that she meets at the Chick Fil A play area, her language development is on track, and academically she is on track. Then I am thinking about worse case scenarios- does she have a developmental disorder? Could she be on the spectrum? Is it something else that I’m not seeing? And then like I do, my mind snowballs into IEP’s, behavior plans, accommodations and dealing with the school system. I am sitting at work and while I am talking to teachers about behaviors, in the back of my head, I’m thinking, “That sounds like Sophia!” Or, I am looking at screening checklists for autism and other disorders, thinking about what my answers would be for Sophia. I know Will is annoyed by all this and he disagrees wholeheartedly that Sophia’s difficulties are anything more than her temperament/personality and that SHE IS JUST FINE. JUST FINE. I’m still not 100% sure but I do know that either way, she is still my spunky, sassy, caring little girl regardless of any diagnosis or label placed on her. I picked her up from daycare after talking to her teacher about my thoughts and she looked at me with her big, brown-almost black eyes, smiling, telling me about how her day went, and all the thoughts that were occupying my mind throughout the day, melted away. This is my girl. Simple as that. What our next steps are, I’m not sure. I do know that we will probably need to support Sophia and advocate for her in the classroom setting. I realize it is only November and she still has a good chunk of the school year to become more emotionally/socially ready for Kindergarten. This brings some peace to mind. I also know that there are resources and tools out there for parents with the same questions as ours. We will probably have to do some work at home and practicing of social situations. If you have any worries at all about your kiddo’s development, trust me in this- you are not alone! As I said before, I think every parent questions whether or not, at one time or another, if their child is on the right track developmentally. If you do have any questions there are resources out there! I have shared my favorite resources and if there are any concerns, do know that early intervention is key- the sooner the delay or concern gets addressed, the better the outcome. http://www.heartlandaea.org/- Early Access. A great, free service for kiddos 0-3. Concerns about development- speech etc. these are the people to call! 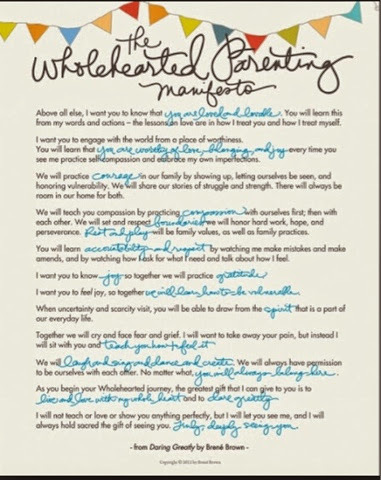 A little blurry but one of my favorite readings about parenting by Brene Brown.